Manchester’s Jihad: More Than Meets The Eye, A Stepped-Up Phase! What IS The Message To America? ALLAH’s Muslim Terrorists aim for topmost carnage, in what should be coined ‘”the maximum effect of terror.” Yes, jihadists recognize (even if only on a subliminal level) that without said continuous (emphasis placed) mental terror – that which keeps citizens demoralized and hyper-anxious – there is no way in hell that America will submit. Fall. NOT only that, a nation which has millions of patriots – many of whom are, thankfully, armed to the teeth – will not go quietly into the night. Moreover, America’s birth sprung from the bloodiest of battles and was founded upon a unique set of freedom-based principles, those which align with Judeo-Christian underpinnings, despite the lying jive-talk that the nation is Judeo-Christian AND Muslim! Indubitably, it is safe to assert: America is unique unto itself. EVEN so, Islam’s barbarians expect that once Europe is a done deal (and it has less than a leg to stand on, perhaps, a toe or two left) the full-on battle to bring America to its knees is at bay. And in all honesty, they have a viable chance to succeed. Alas, first things first. Germans have failed to grasp how Muslim immigration has transformed their country and will have to come to terms with more mosques than churches throughout the countryside, according to the Frankfurter Allgemeine Zeitung daily. “Our country is going to carry on changing, and integration is also a task for the society taking up the task of dealing with immigrants,” Ms. Merkel told the daily newspaper. “For years we’ve been deceiving ourselves about this. Mosques, for example, are going to be a more prominent part of our cities than they were before.”…..continue reading…. ATOP it all, Frau Merkel really, really believes – a pox on her totalitarian head – that “Islam is not the source of terrorism but the Christians who make Muslims feel angry because of Islamophobia are.” You got that? Never mind that there is no such phobia, that it is made up out of whole cloth! Thereby, stick a fork in Europe and consider it to be DOA. IPSO facto, the question isn’t how could the carnage have happened in Manchester, England but how could it not. More specifically, just substitute Manchester for another city in Britain (similarly, all over western Europe) and the bloodletting will be the same. Jihad IS jihad! AND as is increasingly the case with America’s soldiers for Allah, Manchester’s Islamic barbarian, Salman Abedi, was a known quantity to British counter intelligence, yet he was allowed to travel to Libya! So on and so forth. British security and intelligence services are freely admitting that Salman Abedi was known to the police – but not as a “high risk.” The part of South Manchester, where the bomber maintained one of his addresses, was known as the haunt of at least 16 Muslim extremists who went to Syria. Some were killed there fighting for ISIS. Wednesday, five more suspects were picked up as Abedi’s associates. More facts emerging about the Manchester bomber, who was born locally to Libyan parents and dropped out of university after two years, indicate that he managed to stay out of sight for some time, while collecting the materials for manufacturing bombs. Indeed, he has since been discovered to have traveled to Libya and returned home just days before he reached the packed Manchester Arena to blow up young music fans, without touching off red alarms. The British are also embarrassed by their difference of opinion with the French authorities over which terrorist organization ran Abedi, although the Islamic State claimed responsibility for his attack. British anti-terror intelligence officials believe he belonged to the Libyan Islamic Fighting Group – LIFG, one of whose leaders is reputed to be an expert bombmaker. This group is based in Libya, where Abedi’s parents still live. With roots in Al Qaeda, the LIFG fought against Col. Qaddafi and was crushed. Some of its leaders who fled into exile ended up in Manchester. However, French intelligence have information that the bomber used his Libyan trip for a secret side-journey to Syria where he had “proven links” with the Islamic State. This information was relayed to Prime Minister May by French interior Minister Gerard Collomb, and is being investigated by the British. Collomb urged the two countries to continue cooperating closely on counterterrorism efforts even though Britain was on its way out of the European Union. RESULTANT, rational queries become: how is it possible that known Islamists are allowed to visit – for whatever given reason – hotbeds of terror-ridden nations, only to freely reenter their home country – or another western destination – with battle plans at the ready? Better yet, doesn’t 1 + 1 (still) = 2? And what about the so-called “no-fly” terror watch lists? Even more so, Abedi’s family is linked to al-Qaeda and ISIS and intelligence officials knew this! Patriots, aren’t these fair questions? More enraging, knowing that airline agents are busy fondling this one and that one for “protective” measures, Mohammedans are free to come and go!! Besides, doesn’t officialdom (American/western) realize that nihilists are seeking our total destruction, or is their real mental “terror” rooted in “offending” savage barbarians via “racial profiling” which will save countless lives? GRR…. ONCE again, wouldn’t you know that the CIA has its fingerprints all over the fighting prowess of Salman Abedi and his family, plus other “preferable” jihadis! How can this be? WELL, in the same way in which the CIA trained al-Qaeda to fight against the Soviets in Afghanistan – we all know how THAT turned out – code-named “Operation Cyclone”, similarly, they trained Abedi and his family to overthrow Qaddafi! Effectively, every time the CIA and its surrogates insert themselves into jihadi wildfires, disaster follows. AS per the stepped-up phase and message to Americans – listen up! ALLAH’s Muslim Terrorists will kill and kill, that is, until every kuffar is either subdued or dead. This is a fact. LEST anyone believes that the above is an anomaly and cherry-picked, know thy war-mongering Qur’an well! Over 109 directives in this “holy book” are similarly worded. 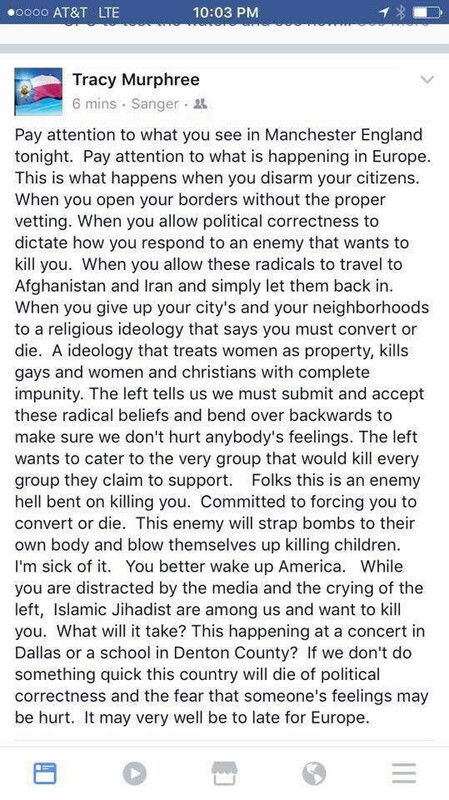 IN this regard, in the same way in which Manchester’s Islamic barbarian targeted a concert where kiddies were expected to be in plentiful attendance, so too is this KEY to the stepped-up jihad in store for America. Guaranteed. IN no uncertain terms, terrorist leaders have made it very clear: they will strike at the heart of the west, the kiddies, knowing that all hell will break loose. And if more proof is required, keep reading…. As we all know children are the future of the world. Sadly most Muslim children are being taught hate and violence from an early age. Most people think Muslim children are only being taught this ideology in Palestine and throughout the Middle East. The vast majority of mosques in America teach hate and violence. There are several references in the Quran that inform Muslims to never take Christians and Jews as protectors and friends. The Sunni manual Tafsir Ibn Kathir is an excellent reference to what children are being taught in Islamic schools. When I was in Iraq I had the opportunity to interview several captured Al Qaeda members. I asked them what type of future attacks America would endure. The answer over and over was that the hearts of Americans would be attacked. They explained that this meant the American children would be attacked because they are the hearts of the American people. These terrorists said the attacks would not necessarily be physical attacks, but rather a slow indoctrination in U.S. public schools and universities. The indoctrinating would include the Islamic ideology is peaceful and even as non-Muslims they support Islam and the Muslim people. I have had several Islamic leaders tell me that Muslims who practice ‘Pure Islam’ have what is called ‘Black Hearts’. These Muslims had no conscience, feelings, emotions, love or caring about anything or anyone aside from Allah. Essentially they have no souls. They have an empty heart. These people have no feelings for even their own children; needless to say they have no feelings for children who are not theirs. It is just as easy for them to behead a neighbor child as it would be to behead even their own children. Children are simply a tool for them to use to achieve their ultimate goal of an Islamic Ummah (nation) under Shariah law. Based on my experiences and studies, the Islamic ideology itself is a dangerous and violent weapon. The true enemies of the non-Muslim world are the ideology of Islam. We can fight and defeat Hamas, Al Qaeda, ISIS, and the dozens of other Islamic acronyms, but we will lose in the end if at some point we do target the ideology they teach within most mosques. When someone discusses the Hitler ideology of hate and violence, almost automatically people get a sour feeling in their stomachs. Most people realize the ideology of Hitler was a danger to the whole world. Sadly in order to defeat Islamic based terrorists we must have the same sour feeling in our stomach when Islam itself is discussed. Islam is not loving and peaceful and Mohammed never intended for it to be. I will provide my final analysis on this subject: In a very short period of time America will be attacked by ISIS. The attacks will be simultaneously across America and the terrorists know we do not have the leadership in our government to survive such attacks occurring on a regular basis. We will implode. America has only one chance of surviving if these attacks happen. There are over 22 million American veterans living in America. There are several million non-military who will fight for our country and the U.S. Constitution. Americans will never release our right to own guns. 22 million plus veterans and the several millions of other American patriots will fight like no other people have ever fought. They will fight to the end against enemies both outside and from within who seek to destroy America….. 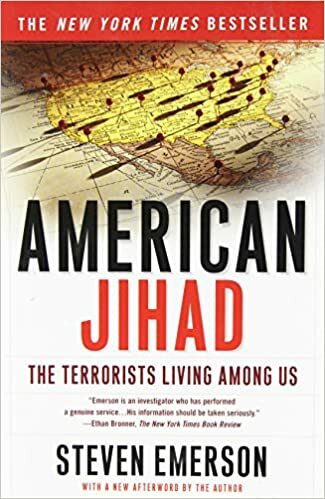 IN reality, less than two decades ago, how many would have believed that Allah’s Muslim Terrorists would have been capable of bringing down the Twin Towers, let alone crash into the Pentagon, the symbol of America’s military hyper-power? Ask yourselves: how could it be that the air space above the most sensitive sites in America are not fully protected, ensuring that any aircraft which flies out of bounds is automatically shadowed? Murphree’s supporters praised him for “speaking and standing up for the truth,” as one comment said, while his critics accused him of fearmongering and ignorance. SO due to all of the above and so much more, who in their right mind – no pun intended – doesn’t believe that Islam IS at war with Christians and Jews, in fact, with all non-Muslims, as well as apostates? Rhetorical. CONVERSELY, isn’t it LONG past due for Christians and Jews to cease pussyfooting around, and resolutely and boldly declare: we are at war with Islam! This is the G-d’s honest truth. PATRIOTS, go from strength to strength. Onward and upward. Kadima!